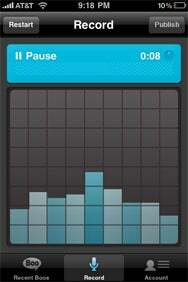 AudioBoo by Best Before Media is a quick and easy way to share audio recordings on the Internet. The app is free, and you don’t even need to create an account to use it. However, you’ll want to create a free account at AudioBoo to make the most out of the AudioBoo features. Boo Are You: Colorful, informative displays and one-button recording make it easy to record boos in AudioBoo that you can post and share with the world. To get the word out that you’ve uploaded a new boo, you’ll want to link your account to social networking sites such as Twitter, Facebook, Posterous, FriendFeed, and Tumblr. Once you’ve done that, anytime you publish a new boo, those following you on these sites will get a link to hear the recording, something along the lines of: “AudioBoo: Reviewing Audioboo http://boo.fm/b59438.” By following that link, your followers and friends can listen to your audio recording, view the photo you’ve attached to it, and see a map if you’ve enabled geo-tagging. Unfortunately, while AudioBoo excels at creating the boos, browsing available boos—including your own—is pretty limited. The Recent Boos screen allows you to scroll through a handful of recently uploaded boos, but there is no way to search on tags, hear boos in your vicinity, or lookup accounts. You’ve also got no way to browse your own boos and edit them. You’ll have to visit AudioBoo's Website to do these tasks. Hopefully, as the app matures, more and more features will be added. AudioBoo shows a lot of potential. The app’s features are beautifully designed with colorful, informative displays. Recording and publishing is a snap and the integration with other social networking sites extends its reach tremendously. You certainly can’t beat the price, but I was still left wanting more robust in-app browsing of published boos.